Cowork Frederick has two meeting spaces available for reservation to non-members (members have access to other spaces). Internet access is included with every rental. Pictures and details are below. 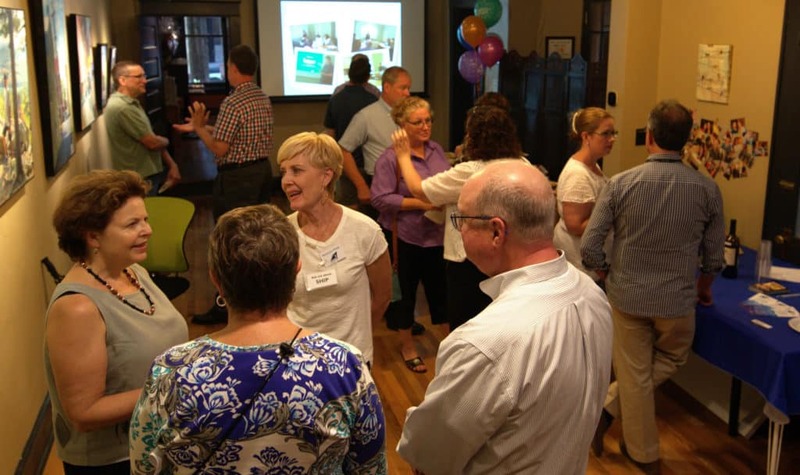 Board meetings, group design sessions, classes or workshops. Presentations, receptions, networking events, classes or workshops. Building Access: This is a historic building with 4 steps to enter and exit and there are also steps inside. The Conference Room is on the second floor. There is no elevator or handicap access. We want to make you aware of this now to avoid any surprises the day of your event. Setup / Cleanup: Your meeting reservation time should include arrival/setup and cleanup time. You will not have access to the room (and possibly the building) until the start of your reservation time. Cancellations & Changes: Reservations can be cancelled or changed up to 48 hours before the start of the reservation for a full refund. There's a $25 fee for reservations changed with less than 48 hours’ notice. Food & Drink: Have a pot of coffee and pitcher of water on us - just ask. Feel free to also bring your own food and drink, preferably from local restaurants. Given our commitment to sustainability, we encourage you to skip disposable plates, cups, etc. We can provide the "real" version. We recommend Beans & Bagels (half a block away) breakfast in the morning - show your reservation confirmation and get 10% off your order. Nearby Sumittra Thai and South Market Sandwich will deliver lunch. If you prefer to head out, there are plenty of award-winning restaurants within walking distance. BONUS: Book an all day meeting and take your pick of $20 in parking vouchers (garage parking only), a $20 Downtown Frederick gift card (good at most downtown restaurants and shops), or a $25 Cowork Frederick Day Pass. Our Conference Room has four 18x72 and two 18x60 inch tables and 12 chairs (20 available) that can be arranged in any way that suits you. That makes this room perfect for board meetings, design sessions, small classes, or workshops. It has three large windows that look out onto oh-so-quaint Patrick Street in historic downtown Frederick and a more comfortable feel than many conference rooms. Our Conference Room comes with all the usual amenities. It has a 4x6 whiteboard and a flip chart for when ideas just can’t be held to a 4x6 space. A projector and speakers are mounted overhead. There's also a speakerphone for "virtual" meeting attendees. 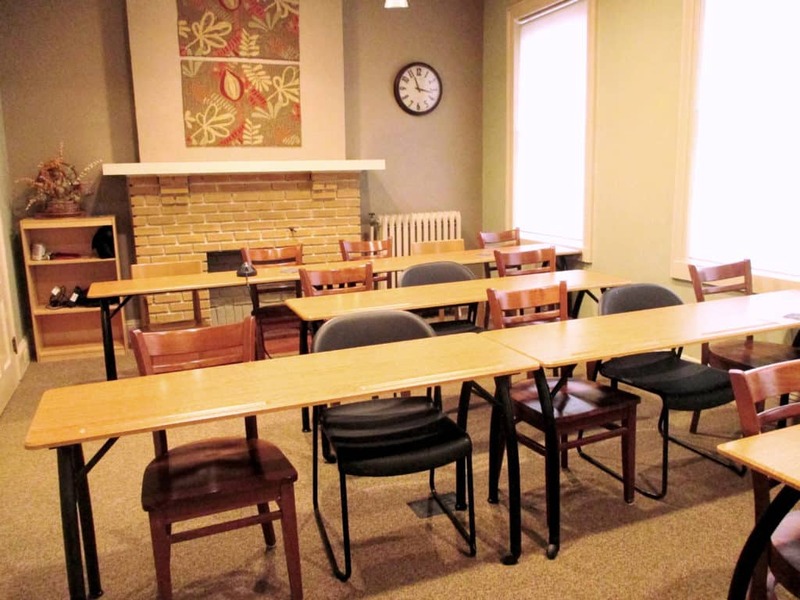 Our Community Room is great for larger presentations, workshops or classes. It also works well for networking, receptions or other events for groups of up to 20 with tables, 30 with just chairs, or 40 standing. Note this room is only available for rent as a meeting space on weekends and there's a minimum of a 4-hour rental. The room has two 3x6 foot tables and several smaller tables and can hold as many as 30 chairs. Arrange them however you want. Or, for an additional fee we can remove the tables and chairs. This room comes with access to our break room with a refrigerator, microwave, and oven where you can keep food warm.